Editors Note: We originally reported this on November 28 and continued to monitor this story from the UK to see how it developed. It originated on the tabloid website — https://metro.co.uk/ which generally publishes things that only some people on Facebook are looking to believe. The article below came out on a tabloid and it certainly bears a closer inspection before taking it at face value. See the subsequent No The Screens are not contaminated article on Washington Post. Thank you Washington Post! Then there is Science Alert. Not that screens don’t need to be cleaned. They do. And they are treated with antimicrobial treatments to ensure they stay as clean as possible. Editors Note: It is amazing to us the number of top-tier, presumably news organizations that felt compelled to excerpt a tabloid site and push it out to the masses though. Maybe our current President is correct in some fashion here. They need to revisit their ethics. Being first and being the most extreme in delivery can reverse the criminal act here in our opinion. I don’t eat at McDonalds but I do read the news. I’d rather not read tabloids or a rehash of one. So says a tabloid headline that conjures an image of stool smeared on McDonald’s self-order touch screens ― you know, those giant screens that people touch just before they eat their cheeseburgers. But the reality is far more mundane, not the public health pandemonium this headline suggests. No, there is no poop on McDonald’s touch screens. There are, however, bacteria — a lot of them. These are the same bacteria that live in people’s gut, intestines, nose, skin, mouth, throat and, yes, stool. Some live in soil and water. The article with the aforementioned headline lists the harmful bacteria that were found on the touch screens of several McDonald’s restaurants in the London area. It notes the infections and diseases people could get from them. Also — The McDonalds order kiosk manufacturers in the US, Canada and Rest of World are using a special hardened AntiGrafitti powder coating which is resistant against aggressive, disinfecting cleaning substances. It is unknown what kind of surface treatment is used or done by the UK manufacturer. Maintenance and design are critical steps and even more critical when it is a multi-national deployment that involves multiple providers in the supply chain. We would estimate as high as 7-10 kiosk manufacturers involved across the world. This incident is just some restaurants in the UK. Here is our page on Antibacterial for reference and also see our recent post on Clean Kiosks. These strains of bacteria are not “an active threat to human health but something to be monitored,” one of the study’s authors said in a statement. Additional excerpt: Matewele said he did not intend to place any blame on the fast-food giant and only wanted to raise awareness, especially among people who consume food at restaurants or other public places. “If people know about it, they can do something. … They can probably take something like an anti-bacterial cleanser,” Matewele said. Traces of feces have been found on every single McDonald’s touchscreen swabbed in an investigation by metro.co.uk. Samples were taken from the new machines that have been rolled out at restaurants across the country – every one of them had coliforms. Are McDonald’s kiosks better than cashiers? ORLANDO, Fla., Oct. 1, 2018 /PRNewswire/ — Panasonic System Solutions Company of North America, an industry leader in food services technology, announced today the launch of its new turnkey kiosk solution that provides restaurant customers an immersive, customized, and faster experience. The new solution will premiere at FSTEC 2018 at the Rosen Centre Hotel in Orlando on October 1-3, 2018, in Booth 801. “Panasonic kiosks have proven that they drive a significantly higher check and that the guests using them experience an overall satisfaction similar to or greater than those placing their orders directly with staff,” said Michael D. Clarke, Owner, Lickety Split Food Services, LLC, a Texas Dairy Queen multi-unit franchisee. Panasonic’s end-to-end platform is managed at the enterprise level, allowing chain restaurants to deploy large installations easily and efficiently. The enterprise-grade application features full Point-of-Sale and Payment integration, a cloud-based enterprise management portal, flexible screen design, highly responsive user interface, suggestive selling, and order customization throughout the customer ordering journey. 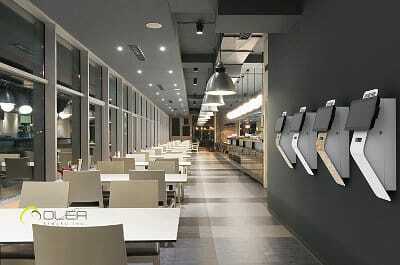 Kiosks are quickly becoming an integral part of the QSR and fast-casual space. Here are some factors to consider when planning for a self-order solution by Olea Kiosks, Inc. The 99th annual National Restaurant Association trade show wrapped up its four-day run May 22, but one of the hottest topics of the event wasn’t food. It was technology. Mobile order and pay garnered quite a bit of attention, as did product vending solutions. One of the real stars of the show, however, was self-order kiosk technology thanks to their demonstrated ability to increase customer throughput and increase sales by automating suggestive selling. Still, it’s not enough for a restaurant operator to just install a kiosk near the counter and wait for the orders to roll in. The design of the kiosk itself goes a long way toward encouraging customers to use the devices. In conjunction though the restaurant needs to ensure kitchen output matches up with kitchen input. Bakery café chain Panera Bread updated their kitchens first and then added kiosks and multi-channel ordering. The objective is more orders taken and fulfilled, faster. There’s little doubt that self-order kiosks will be an central component of the QSR and fast-casual restaurant landscape going forward. McDonald’s expects to have self-order kiosks in most of its 14,000 restaurants by 2020, while Wendy’s currently has them in many of its 6,500-plus locations. Other fast-food operations are following suit, creating their own variations best-suited for their restaurant environments. More compact and less costly designs that are cost-effective to deploy are starting to become commonplace. On the fast-casual side, Panera made self-order kiosks an integral part of its “Panera 2.0” effort, which it began rolling out in 2014. Before the company was taken private last year, officials indicated that sales increases at restaurants outfitted with the initiative were outpacing sales at those without the technology. It’s evident that these companies and others wouldn’t be investing millions of dollars in self-order technology unless it had been proven to offer tangible benefits. To maximize those benefits, though, deployers should take a few critical factors into consideration when planning to incorporate self-order kiosks into their operations. Key to encouraging customers to use self-order kiosks on a regular basis is a clean, simple user interface. The order flow must be intuitive and easy to navigate. Choices should be presented logically, with similar items on the same page and accompanied by professionally shot images. Add-ons should be suggested where appropriate. Also, it should be easy for the customer to go back and make changes if they decide on a different selection. It’s likely that some customers will need some degree of education to encourage them to use a self-order kiosk. For freestanding kiosks, the enclosure and attractor screen should include messaging that illustrates the kiosk’s purpose. Tablet-based kiosks should consist of nearby signage along with the attractor screen inviting users to bypass the line. More importantly, self-order kiosks need to be compliant with the Americans with Disabilities Act (ADA). Are the devices usable by someone in a wheelchair? What about a blind or visually impaired customer? Accessible by all should be ensured. The last thing a restaurant deploying self-order kiosks wants is to be branded with the reputation that they don’t care about the disabled. On the flip side, the disabled will likely be a growing customer base if you support ADA. When it comes to self-order kiosks, ADA compliance is a minefield best navigated with the assistance of an experienced kiosk vendor, and possibly your legal department. A kiosk is a collection of electronic components and as with any such device it will eventually need service, whether that be a simple cleaning or the replacement of a part. Can the unit be serviced easily and with a minimum of effort? Can parts be swapped out quickly, keeping downtime to a minimum? One of the main reasons a restaurant operator will consider deploying a self-order kiosk is to alleviate congestion at the counter and increase order throughput. The misconception that self-order kiosks will help cut labor is just that: a misconception. Many restaurants that have deployed self-order kiosks reported an increase in sales, requiring more, not fewer employees to accommodate this influx. However, increasing the rate at which orders arrive at the kitchen creates another problem. If the kitchen can’t keep up, the result will be long ticket times, crowding by the food pickup area, and ultimately, dissatisfied customers. People tend to order more when they order from the computer as well (25% more). Consider, for example, the experience encountered by Starbucks when it released a mobile ordering app in 2015. The app led to a flood of orders, which in turn led to congestion at the drink hand-off area. Furthermore, many customers came in, saw the long lines, and naturally turned around and left. To solve the issue, Starbuck’s added employees and implemented new systems that enabled stores to handle the additional orders. When Chipotle Mexican Grill restaurants faced similar problems, they began implementing a second make line devoted solely to digital orders. How restaurants handle orders coming in via self-order kiosks will likely be determined by customer flow and the design of the store itself. This could translate to different kiosk form factors being needed. Much like anything else, a best practice is to train employees on how to utilize the kiosks. This is made much easier by deploying a kiosk that utilizes the same components used in the restaurants already. Still, training is important. Think of it this way: If a restaurant installed a new point-of-sale system, they would train each employee on how to use it. Kiosks are no different. Employees should know how to direct traffic to the kiosks during rush hour properly, and how to service the units in a timely manner. If employees recognize kiosks as a tool for them to use, rather than their competition, it is likely the devices will produce a much faster return on investment. Employees will be more willing to push customers to the kiosks, generating more usage and increasing average ticket size. At the end of the day the best way to provide a self-order solution that improves the guest experience, simplifies the restaurant operation, and increases sales is to work with a kiosk vendor who is experienced in the deployment of self-order kiosks and has a track record of success. Olea Kiosks stands ready to help. Click for full size – courtesy Olea Kiosk, Inc. The Austin Kiosk from Olea Kiosks, for example, is a versatile solution available in multiple form factors so deployers can choose the one that best suits their needs. The kiosk is available in countertop, wall mount, and freestanding versions – all utilizing the exact same components to ensure that customers are always greeted with the same technology. The Austin uses familiar POS components such as Elo Touch Solutions, Epson and STAR Micronics-brand printers, and industry-favorite Ingenico and Verifone EMV payment terminals. That’s a belief driving the startup Bite, which creates facial recognition kiosks for quick service restaurants (QSRs). Using a combination of iPads, proprietary software and machine learning, Bite’s tablet kiosks can recognize your face to unlock loyalty programs, bring up food preferences and provide opportunities for restaurants to upsell. Jack in the Box CEO, Leonard Comma, made news this week when he said “it just made sense” for his fast-food chain to consider switching from human cashiers to machines. To be sure, there are big societal implications if every restaurant made such a shift, but what if automated kiosks provide a better customer experience? Cowen says McDonald’s will upgrade 2,500 restaurants to its “Experience of the Future” technology by year-end, which includes digital ordering kiosks. The firm raises its rating on McDonald’s to outperform from market perform and price target for the shares to $180 from $142. Same store sales estimate for 2018 raised to 3 percent from 2 percent. Here is a personal opinion letter/piece that I wrote for rebuttal to Andy Puzder and Rensi. I was deliberately ruthless and demonstrative for effect. I also sent to the Washington Post and may send to some more. I also published as personal letter on the Kiosk industry group site. I am the executive director of a kiosk industry group association that specializes in self-service in all industries. This is in response to the recent news items by Secretary of Labor nominee Andrew Puzder and Ed Rensi, former president and CEO of McDonalds declaring that self-order automation in fast food industry is a “consequence” and a matter of time if we “foolishly” increase the minimum wage. Neither one of them has, to any degree, or wants – to implement modern automation for customers. What they want is to maintain the status quo and use self-order automation as a bully club of sorts. Almost a threat. The status quo? It is generally lowest paid minority and immigrant (legal and illegal) workers, not unlike field workers in early California days. Hispanic and black predominantly. Virtual slave labor to be harsh. That is the model for their fast food restaurants which the majority they franchise and franchisees factor for their ROI. Both minimum wage increases and automation “disrupt” that model and make waves for them. They are protecting that model. Not unlike Hearst protecting the paper mills when hemp was shown to be a superior newspaper print medium than cutting down trees. Outlaw hemp and the mills made money. Meanwhile small business gets left behind, again. They cannot afford the investment for self-order and an high minimum wage is difficult at best for them. How many jobs does Amazon and Bezos create, foster and necessitate? Those automation jobs in the warehouses (even with the automation) count. Those jobs and skills do require training and education. Has McDonalds in Europe, in their corporate-owned restaurants, seen a reduction of labor due to self-order? No. They have increased employment. Puzder and Rensi are change-agnostics. They like it the way it is. The old way. McDonalds is changing for the good. CKE may be glad Puzder is leaving. There is indeed a shift towards more automation in the public space. That certainly redefines workers in the public space as well. I’m from the south and when I was 14 in 1969 my mother took me to the Arkansas bottomland near Fort Smith and had me pick peas and cut cabbage for $5 a day. We did it one week in the summer. That was a lesson in minimum wage I never forgot. I went to school and that is the best thing minimum wage can do.